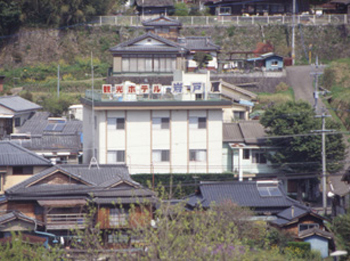 Takachiho is the place of legends and folklore. 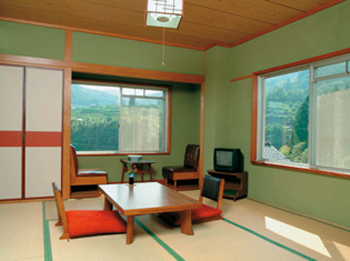 Hana Ryokan Iwatoya is located at Amano-Iwato in Oku-Takachiho. 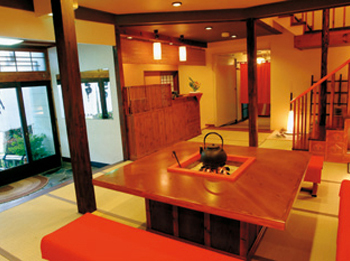 The entrance is modeled after Amano-Iwato Cave, and the entire floor is covered by tatami mat. The cuisine is served with abundant of natural ingredients and local products and has a great reputation with natural food lovers. The hotel provides a free shuttle service for guests who wish to go and see the Night Kagura, designated as a National Important Intangible Cultural Asset, and free tickets for Amano-Iwato Spa. 10 minutes by taxi from Takachiho Bus Center. 20 minutes on bus from Takachiho bus center bound for Iwato and 5 minutes walk.